The mission is twofold: to grow wrestling in Brookline and to build a greater sense of community between the middle and high schools. Our goal is to provide a platform for the HS wrestlers to engage with the younger kids in a structured environment where the HS wrestlers will be put in a leadership role. This will help build their communication skills and self confidence. The message presented to the High Schooler is “Show what you know”. Your coaches, teachers and parents have invested in you to help you get to this point, now it’s your chance to pay it forward in the community. The youth wrestlers benefit from the personal attention and seem to stay more engaged with HS wrestler coaching. Creating a connection with kids from grades 3 to 12 will help build a greater sense of community and school pride. Wrestling is one of the oldest sports and provides many life lessons that will carry on with a youngster after he or she no longer competes on the mat. Discipline, dedication, hard work, sacrifice, courage, accountability, responsibility, and service are just a few of the attributes that can be developed. Wrestling is designed for all shapes and sizes, where the opponents are grouped by age and weight for competitions. It takes courage to even step on the mat since the wrestlers individual skills and determination are revealed immediately. For a beginner, the likelihood of being put in an uncomfortable position and the possibility of physical consequences are high. Wrestling at face value may seem like a pure physical battle, but as skills increase the competition becomes more like a chess match. The wrestler works to build physical stamina, and studies and practices to develop techniques to outmaneuver his opponent. We hope to make incremental investments in character. “I may have lost today, but I will get up, shake my opponent's hand and his coach and will possess the courage to move on.” Simply stepping on the mat when the outcome is unknown is a win. Wrestling instills the discipline to work hard to get better, be accountable for one’s efforts, and take responsibility for the outcome. It is an individual sport, but also can be a powerful team activity where each team member’s individual efforts contribute to the overall team success. In today’s world there are tendencies to bubble wrap our kids, but are we really preparing them for the challenges and competition they will eventually face when out on their own? Wrestling is a controlled activity the helps our kids learn valuable lessons of sportsmanship, respect, challenge, and competition that will serve the youngster in whatever goal that they work to achieve in the future. 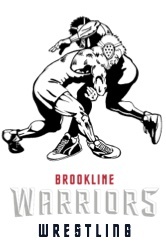 With the support of the Brookline Grapplers Booster club, the High School wrestling team runs a youth clinic and area open tournament each Fall and Spring. The clinic is designed to provide an introduction to the sport and pairing of youth wrestlers and HS wrestlers. The HS wrestler is responsible for working with the youngster individually to review the techniques being covered. The high schooler is responsible for following and working with the young wrestler right through to the tournament were the High Schooler will be in the corner of the youth wrestler coaching him/her for each match. The goal is to form a unique bond where we are not only facilitating a personal connection, but a community connection where the High Schooler is routing for and supports the younger wrestler and the youth wrestler may look up to and cheer on the HS wrestler at the Home matches. 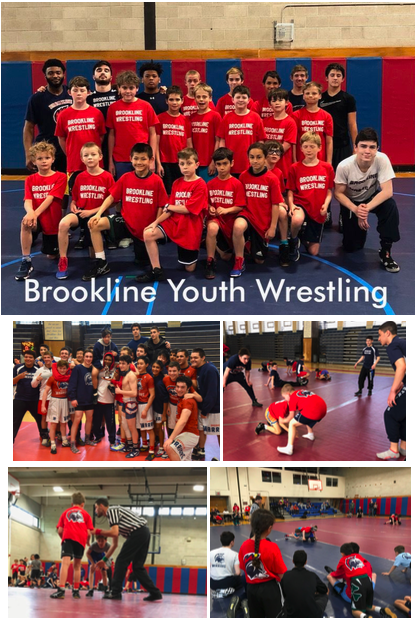 In addition to the youth connection, we hope to build a strong parent community for youth, HS, and alumni wrestlers that will not only grow the sport in Brookline but form friendships to tighten community bonds and increase support and spirit for our town and school for years to come. From our early success we have started to see the youth wrestlers attend HS matches. Having a connection between high and middle school will hopefully help ease their transition to BHS. This coming season, several freshman who started in our youth program will join the HS team and have already started to work out with the upperclassmen in off season activities. Teaching kids from an early age will help feed the High School team with experience wrestlers, which in return should produce more winning, and hopefully develop a culture for these efforts to continue. It has been very gratifying to see a HS wrestler instinctively comfort a youth wrestler after a loss, as well as taking great pride in coaching and seeing the youth wrestlers succeed. In 2017-18 the BHS wrestling team had a record breaking season finishing 4th in D1 States, 11th in All-States, and ended up as the 2nd highest placing Massachusetts Team at the end of year New England Championships. Our head coach Trevour Smith was also honored as the BHS coach of the year for his dedication and tireless efforts. Let’s keep up the positive momentum! The fall youth events include, the Free Youth Wrestling Clinic November 4. 2018 1-2:30PM @ Tappan Gym and the Fall Brawl Youth Tournament November 11, 2018 8AM-4PM @ Tappan Gym. Come join us for learning, fun, and grappling competition. Please pass on this information to anyone you think may benefit. Our goal is to expose as many kids as possible to wrestling and promote its many on and off the mat benefits to support and grow our community. GO WARRIORS!